Eldon Gunderson may be 84 years old, but he has a fast car. 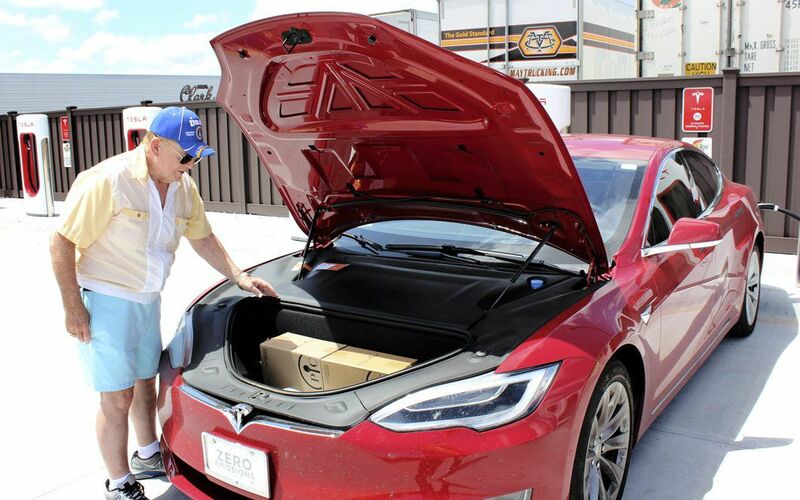 Gunderson, who lives in Goodyear, Ariz., stopped at Bosselman Travel Center on Friday to charge his Tesla Model S. He gave the electric vehicle a dose of energy at the Tesla Supercharger near Bosselman’s. Gunderson and his wife, Barbara, had begun the day in Pukwana, S.D. They planned to spend the night in Cheyenne, Wyo., before resuming their electric journey back to Arizona. Gunderson, who spent 27 years in the Air Force, said he loves “everything” about his Tesla, which he bought in March. Before that, he had another Tesla, which he got in 2013. Grand Island’s Tesla charging station opened in February of this year. Known as a Supercharger station, it can serve eight Tesla owners at a time. Customers who present their Tesla fob at the nearby Thunder Road Grill can receive a free appetizer with the purchase of an entree. 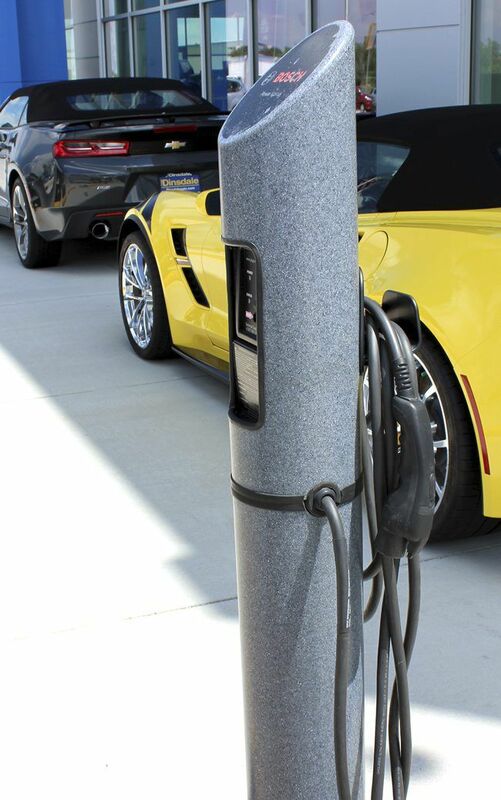 The Bosselman facility is one of two electric car charging stations open to the public in Grand Island. Tom Dinsdale Automotive has two chargers, which are available 24 hours a day and offered at no charge. Rich Johnson of Dinsdale Automotive said the chargers are used by people from other states, such as Texas. “It’s kind of cool. You get to see some different types of cars,” he said. One of the charging pods is on the south side of the business. The other is on the west side — right in front of the store. Each station is a Bosch Power Xpress. Grand Island, though, hasn’t yet had any municipal involvement in setting up a charging station. In terms of serving electric cars, Grand Island lags behind many Nebraska cities, including a number of communities in Central Nebraska. Charging stations can be found in Hastings, Kearney, Lexington, Gothenburg, Holdrege and Central City. The likelihood of a charging station coming to Grand Island increased in March, when the city joined the Nebraska Community Energy Alliance. The six cities mentioned above are all members of the Alliance, as are 20 other cities. The alliance uses grant funding from the Nebraska Environmental Trust, which receives 44.5 percent of the profits of the Nebraska Lottery. The Nebraska Community Energy Alliance (NCEA) was founded in 2014 as an inter-local cooperative agency. The alliance’s mission is to “build and promote advanced technologies for housing and transportation that save energy,” reduce carbon dioxide pollution and cut costs. One way Grand Island might get a charging station is through Volkswagen’s settlement with the federal government over the car manufacturer’s misleading use of diesel engines. The U.S. Environmental Protection Agency filed a complaint against Volkswagen, alleging the car company violated the Clean Air Act with its diesel engines between 2009 and 2016. Volkswagen agreed to spend $14.7 billion to settle the allegations. Of that amount, $2.7 billion was placed in an environmental mitigation trust. That money will be given to states, tribes and territories. One way the money will be used will be to build charging stations for electric cars. Anne McCollister, executive director of the NCEA, submitted a request on behalf of Grand Island and eight other communities along Interstate 80 for VW settlement money. She doesn’t know when that money might become available. If it does, she’s not sure if the money will get as far west as Grand Island. It might be centered in the Omaha and Lincoln areas, she said. Aside from the Volkswagen application, an entity in Grand Island is interested in bringing a charging station to the city. But no final decisions have been made. Grand Island, North Platte and Fremont joined the Nebraska Community Energy Alliance this year. Becoming a member cost Grand Island $1,000. Benefits of participation include applying for grants to purchase electric cars for a city to use in its operations. Some cities were reluctant to join the organization because they were being fiscally prudent. It also hasn’t been entirely clear whether electric cars were going to catch on. Seeing cities coming aboard has a lot do “with the market being proven now,” McCollister said. Electric vehicles are at least turning a corner. Volvo recently announced that it will go all-electric in 2019. Gunderson, meanwhile, loves the technology of his Tesla Model S 90D, the pricetag for which was $115,000 to $118,000. The car, he said, requires almost no maintenance, and the company offers very personal service. He also likes the car’s acceleration. It can go from 0 to 60 mph in 4.4 seconds. On the highway, the Tesla virtually drives itself as long as you touch the steering wheel from time to time, Gunderson said. From up to 200 feet away, you can summon the car and it will come to you, he said. The vehicle can also search for and find a parking spot, he said. He likes the looks of the car, which is not unlike a Maserati, he said. Gunderson also cares about the environment. He has solar cells atop his home, which is in a retirement resort. He also recycles. The facility at Bosselman Travel Center is one of 900 Tesla Supercharger stations around the country. Those stops include more than 6,000 individual Superchargers. It takes 30 to 45 minutes for a Supercharger to recharge a Tesla. That charge will allow the car to travel 170 miles. Tax benefits are very much available for environmental projects. Car manufacturers can claim a $7,500 tax credit for environmentally friendly vehicles, McCollister said. The Nebraska Environmental Trust also provides assistance as a funding partner. Because of the arrangement, a city will initially lease and then purchase the vehicle. Hastings’ electric vehicle charging station, which opened in October, is in the parking lot of the Hastings Museum. At the same time it built the dual-pump ChargePoint station, Hastings added a 2016 Ford Fusion hybrid vehicle to its municipal fleet. Cost $1/hr, $2 min., $5 max. Description Charging station is south of the Museum in the south parking lot, next to the brick well house.